The team of 10 journalists that I had the chance to work with, incredibly described by Andrew Burton, The photographer. Because Ernest Hemingway once said: “I want to be Ernest Hemingway”, or if he didn’t say it, we are sure he wanted to. Do you remember? At the end of the 7th Unesco Youth Forum, you, young and beautiful delegates coming from all over the world, you voted for a report who was supposed to be presented at the 36th Unesco General Conference. And do you remember? You voted for two young and beautiful delegates, Miika Tomi and Nasma Dasser, to be the ones in charge to present the report to the General Conference. Usually, we tend to forget about the last parts of our project: the forum was great, I met a lot of nice people, I started collaborating with others on amazing projects all over the world, and then, yes, it happens, we forget about the Report. That’s why, I decided to go back to Unesco (and not only to follow the vote about Palestine, come on), to interview Nasma and Miika, the two chosen delegates with the more difficult task ever: to make the General Conference listen to them. Education, sustainable development, youth participation, improvement of the youth forum: these are the main four parts of the report that the young delegates approved at the Unesco Youth Forum. 27 concrete proposals presented to the Conference and one big goal: to raise-up the voices of young people. Are they really listening to them? They think so and the importance of the Youth Report has been recognized by all the “old delegates”. 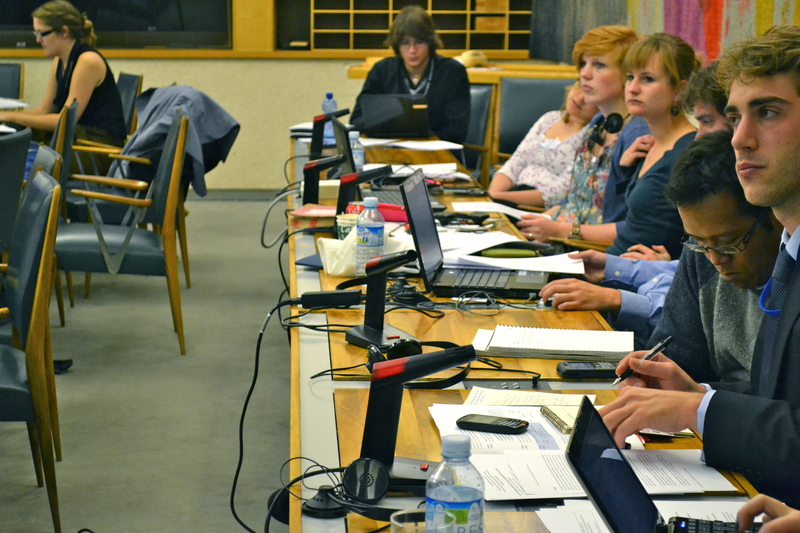 Is Unesco, the right place in which to work for a real change? As says Nasma, “there is no single way to bring change. If you want to bring it to Unesco, do it; if you want to bring it to your family, your community, your society, just do it”. That’s a great start. And don’t worry, Nasma and Miika we will continue following you. Things I have absolutely to share before it raises the sun, even if I’m exhausted, even if Italian journalism today gave me other bad lessons about how life works (and how “gavetta” suks a lot, because to be in a place is not enough if you are not somebody who has been writing for ages about topics. Maybe I lost the point, isn’t it journalism to document what you’re actually witnessing? Maybe not). By the way, today, in my young and useless life I witnessed a small piece of history and I would like to share with you what I saw and what I got of all this crazy “ambaradan”. 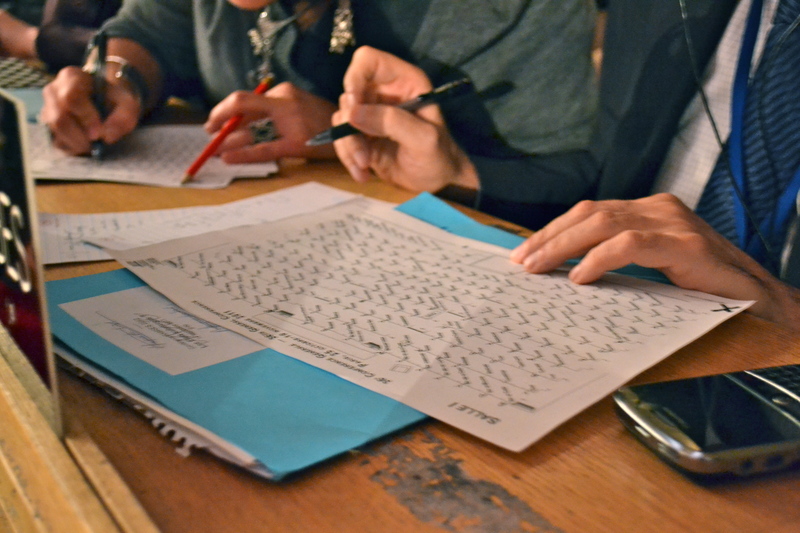 For me, the vote about Palestine entering Unesco will be always represented by the men behind me, one of the delegates of the “League Arabe”: an head bent over a white paper with a black pen, just matching “YES” or “NO” or “ABSTEINED” after every declaration. Canada, no. Usa, no. Spain, yes. Cuba, yes. While I was sitting on the stairs, in the middle of cameras, televisions and real and professional journalists and while I was just trying to follow the votation, I suddenly realized that man behind me. And I suddenly stop paying attention to the process and I started looking at him: for every yes, one smile and one small jump on the chair, but for every no, he was just saying with a disappointed face “we are no surprised , we know already about you”. And the success of the operation, before to be declared by the President of the General Conference, has been in the eyes of that small men behind me and on his paper, before white and now full of crosses under the column “yes”. He knew already the result, two minutes after the end of the votation, but he was so afraid to have made some mistake that he just spent his time counting and recounting the crosses. And finally, that’s it: beside the problems, the discussions and the doubts, Palestine is the new member of Unesco organization. 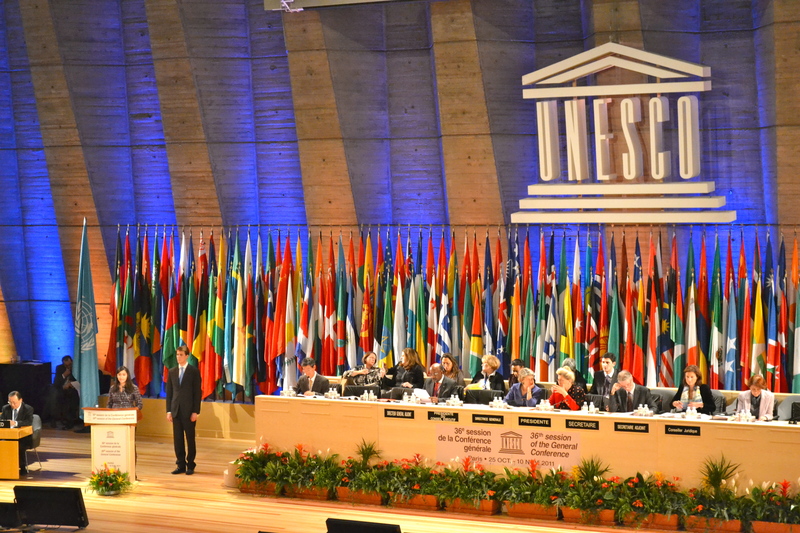 I, witness of history, just sitting on the stairs of Unesco, on the far side of the room, between photographer and journalists. So history is something like this? About diplomacy I don’t really understand a lot, but I would like to tell you what I saw. The speech of the minister before the vote was clear: “we want to stress the fact that this vote is not related to our accepation at General Assembly of the United Nations”, said Ryad al-Malik. But right after the positive vote, the pression and the considerations were totally different: “this is the victory for one of our struggles. We’ll continue to work to win the other struggles we are conducting all over the world. Palestine is there and nobody could take it off the map”. Canada, United States, Israel, Sweden, Germany: some of the votes against the Palestinian admission who made more noises. France, Austria, Belgio, Cuba, Brasil, some of the yes. Abstentions: too many, and Italy first of all. Europe? Totally broken in different positions, showing how difficult is for the European institutions to go on with a clear and unique position on important topics. Europe is one of the loser of this votation, not able to take the ground in defence of one idea. Shocking the vote of France, not clear at the beginning and suddenly turned to a strong “yes”: “maybe we should stop hiding ourselves, it is time to take our responsibility. Starting from now, we don’t have choice any more”. But the core of the issue is, as you can imagine, in the last line of the room 1: somewhere hidden over there, there are Usa and Israel’s delegates, persons who spoke in the name of an idea, a country and a conflict who is lasting since a big part of us has seen the light of this world. And what that people said, is what I learnt today from history. To speak was the Israeli delegate: “I thought that Unesco stands for United Nations Educational, Scientific and Cultural Organization, where Scientific means science and not science-fiction”. (This is strong right?). 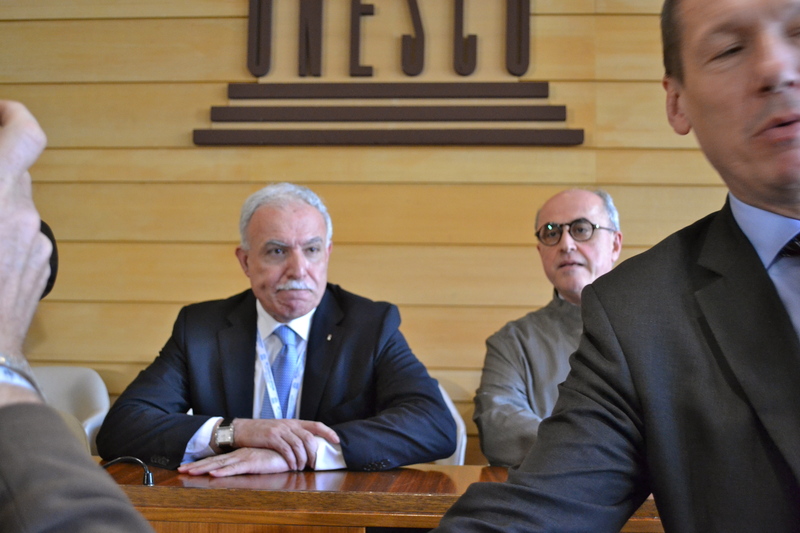 And then: “What is happening here is a tragedy for the idea of Unesco. 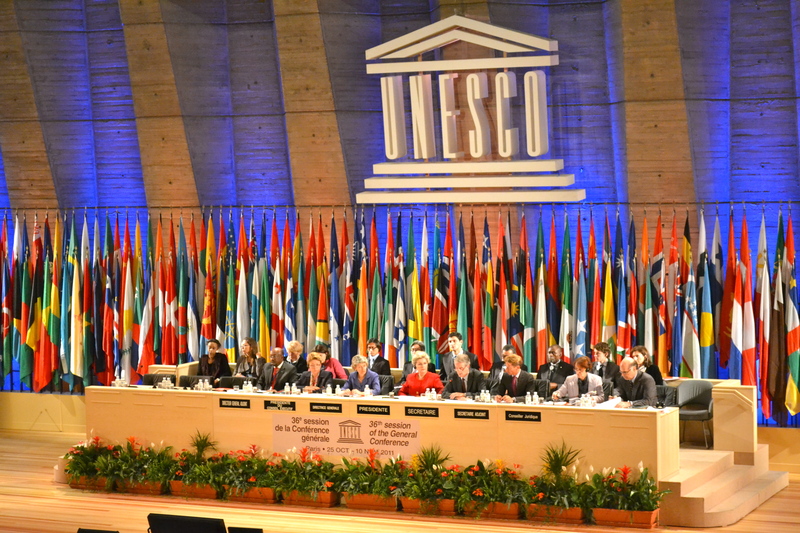 This is a sad day for Unesco who decided to disconnect from reality”. And this is my lesson: Unesco, today, while voting, while clapping hands after each “yes”, while standing to say “welcome” to the new state, while laughing and smiling for the result, Unesco and its organization staff was totally and absolutely disconnected from reality. Yes, because reality says that the 22% of the budjet of the organization comes from the fundings of USA and, the United States decided just to stop founding the institution who recognizes Palestine. And, basicly, this means that Unesco could be death tomorrow, without the 22% of the founds. So yes, Unesco was so disconnected from reality who decided to let a state to sit on the room, with his mark, his name Palestine written down officially while there is a big confilict still going on between some of the states who are sitting around the same table. Yes, Israel was right: the decision to let Palestine go in was so unreal, so not logically justified that the only comment could be: why? And all that delegates just clapping their hands, like if they were changing the world, maybe they were just crazy people in a diplomatic room who didn’t really understand that from tomorrow USA could do whatever they want about Unesco and its future. And then, after all these nice considerations, I went back to the stairs, where it started my long morning and I realized that, wow, this is how history change. This is how change is actually happening: when somebody is so brave just to do something totally disconnected from reality and like a science fiction. Because, I mean, dear Israel and Usa’s delegates, reality is not so good to need to be protected and preserved, and we know, that revolutions are always made by crazy people just doing illogic things, following passions, justice and devotion to their proper values. People totally disconnected from reality will change the world, because they are the only ones able to believe in what they don’t see yet. Do you have a job? No. No. No. No. No. No. Spain, Greece, Italy, Irland, France, Finland are the countries of the young delegates that I had the chance to interview in the last days. And the answer it has been always the same: no I don’t have a job, no I don’t think that I will have one really soon, yes I am trying to do an internship. This is how this young generation is presenting itself. No hopes, but a lot of idea and solutions. In my opinion, as you can see in the video, the european generation of unemployed is a really strong one: strong ideas and a strong will to change the status quo. Because if the future is dark, the only thing that we can do is to react. When Unesco preach something and do the opposite and my special thanks to all the interns who have been working in this Unesco Youth Forum. My post for today it was supposed to be about unemployment as yesterday I had this really interesting interview with Gianni Rosas, the coordinator of the employment program at Ilo (International Labour Organization). And always yesterday I collected some interview concerning job and young people, just asking: “do you have a job?”. And, trust me, what I got is more than interesting and more than what we could expect about it. So, at first today I was supposed just to edit all the interviews and put it on youtube (and I’ll do it really soon), but what I discovered doing my small reportage maybe deserve to be discussed in a proper post and to be done before the end of the forum, before than everybody just go home. Me: Name, age, where do you come from.. bla bla bla. Do you have a job? They: blab la bla. Oh no, I don’t have a job but I’m doing an amazing internship in Unesco, and it is so incredibly interesting. Seriously, I love it. Me: Oh cool. And is the internship paid? They: No, actually no. But sorry for what do you need it? Oh no no, is better not to speak about it. And if you want, you can ask to other interns, there are a lot of us working for the organization of the forum. Did you know it? Me: Oh. No, actually I wasn’t even thinking about it. In these four days, I have been working as a youth blogger and journalist for the Youth Forum, selected with other nine amazing young journalists from all over the world. We had to cover the event from 8 to 20 that always it has been transformed is something like from 9 to the end of everything, like 22 or 23. The youth bloggers had the chance to not only follow the event showing their different prospective, but also to sit in the organization office and to watch from inside what is happening there. And this is transparency, I think, with all the consequences of the case, the good and the bad ones. And what I discover in that offices, staying there for hours is that there is a staff of people who has been working for days and hours, with no stop and no pauses, just working. They were there at 7 o’clock and still there at 11 o’clock when I had to leave, they were doing whatever it was necessary, from the most small and stupid organizational problem, to the biggest and more difficult one. And, what I discovered also is that to do all this big big job was of course the staff official of Unesco and plus, of course the interns. And for what? Nothing. The interns of Unesco who has been working everyday organizing whatever and with whoever, they weren’t earning any money. Just a reimburse of 40 euros each day. I am not discovering nothing new, and I mean, all the young people in the world are facing this problem, but I do believe that in this case the situation is even worst, if it is possible. Unesco is organizing a big event like a Youth Forum and it is just asking to experts and delegates to come and speak about unemployment and it is stimulating young people to raise their voice, to ask for what they need. So if you are doing al these things than you are supposed to have a really clean conduct which nobody can attack in any case. And this is not the case: if you are asking us to react, to do something and to pretend to be respected how can you accept one system in which interns are working so much without being payed at all? And I am really sorry because I really enjoyed these days and I was so surprised to find a great staff of people so motivated and enthusiastic. It was really inspiring for me, just because for a while I thought that there were still places in the world which are different from what we are used to. And for all these reasons now, I am so sorry to go back home with this feeling of betrayal: Unesco made me believe they are different and then they are the same as the others. And this is sad. I would like to end my terribly long post just saying thanks. Thanks to all the interns, the volunteer and the organization staff who have been working for days and hours with that passion that everybody experienced. Sharing the office with you, it was an honour and one of the best experiences in these days, because I saw something that I would never have expect: passion for your job. And now that I know that a lot of you were not payed at all, I admire you twice. So thanks non payed interns of Unesco, who created all this. And just another thing (the hardest part of the game): we will have non payed internship just until the day in which there will be young and passionate people accepting them. We, participants and delegates, going back home we will try to raise our voice, please try to do the same: you won’t be alone in this fight. One of the plagues of our generation: youth unemployment. “The risk is that you will be the lost generation”. These words may sound discouraging, especially if used by Gianni Rosas, the Coordinator of Youth Employment Program at ILO (International Labour Organisation). He is the expert called by UNESCO to speak at the 7th Youth Forum, about one of the more difficult theme concerning our present. And Rosas arrived with a brand new update of the “Global employments trends for youth”, which sadly says that 75 million young people in the world are without a job. In front of these shocking numbers, all parties have to try to react. “The main problem”, has said Mr Rosas, “is that this generation is giving up with hope and this is a terrible consequence. They just not expect anymore to find a job”. But Mr Rosas has come not only to give bulletin of war, but also to propose solutions: a good education plan and well-focused practice experiences are the main ingredients presented by the expert. “Our update”, affirmed Gianni Rosas, “would like to warm countries and to force them to do something: it is important to transform theory into practice before it is too late”. 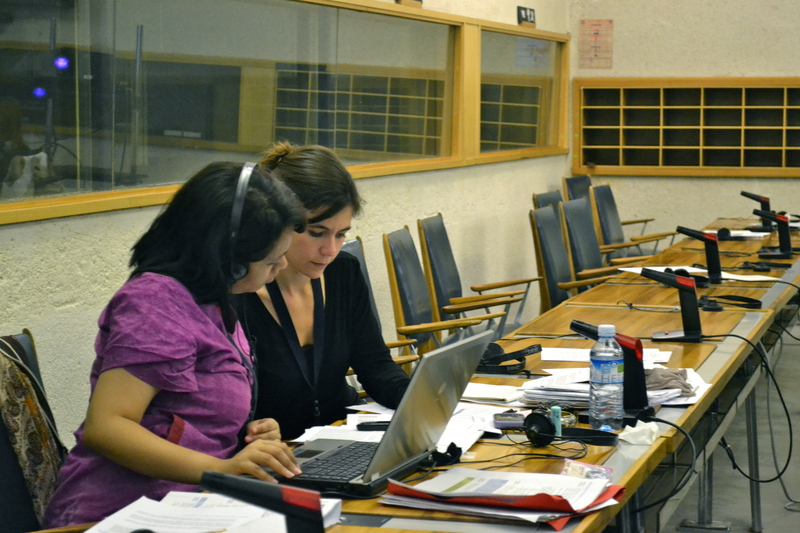 The Youth Forum Drafting Committee is at work in the room 8, working on the final document: everybody can go there and check what they are doing. Delegates are invited to participate with ideas and opinions. So what are you waiting for? This is the time to express your opinion, if there is one possibilities in these days to say what you think is NOW. Is there gender equality in your country?